More than three-quarters of US microbusiness owners say they are very (42%) or extremely (35%) happy to work for themselves, according to Vistaprint's newly launched Small Business Happiness Index, which tracks the pulse of US microbusinesses. Moreover, 35% say they wouldn't even consider working for someone else. 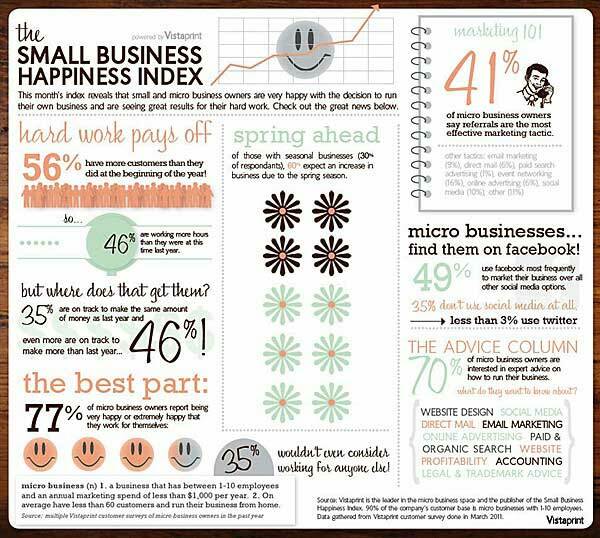 Below, additional findings from Vistaprint's report, featuring the Small Business Happiness Index. Hard work pays off. Though 46% of surveyed microbusiness* owners say they're working more hours than they did a year earlier, 56% now have more customers than they did at the beginning of 2011 and 46% are on track to earn more this year.